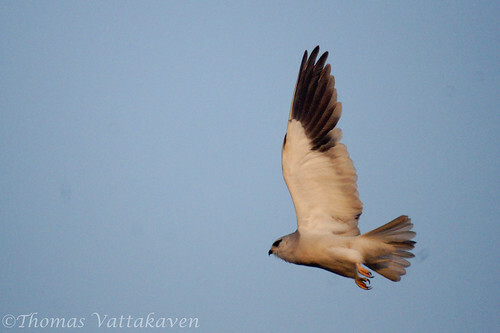 The Black-winged Kite (Elanus caeruleus) is a small kite which is best known for its ability to hover in mid air like a Kestrel. 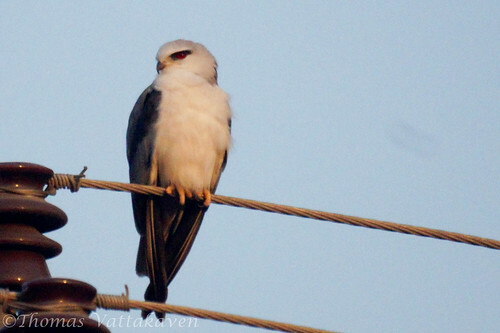 It is very similar to the Australian Black-shouldered Kite (Elanus axillaris) and the White-tailed Kite (Elanus leucurus) of North and South America. 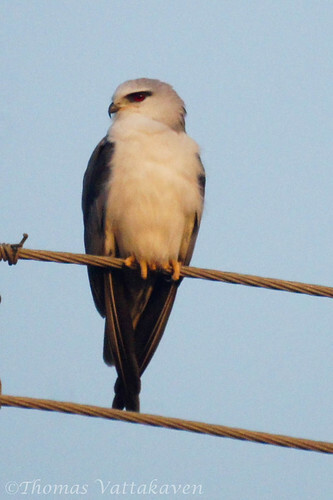 The forehead, face and the lower plumage is white, except the region immediately around the eyes, which is white. The remainder of the upper plumage is grey. The shoulder patch and wing tips are black. 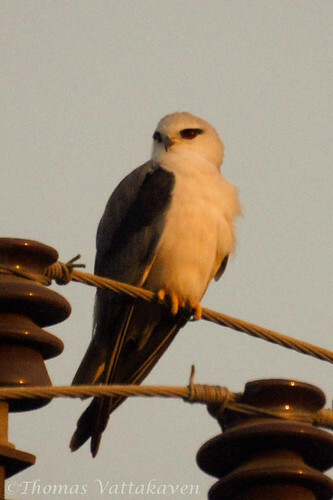 The tail is mostly white with median tail-feathers and the outer web of next pair light grey. The sexes are alike. Juveniles may have a rufous-fulvous head, browner shoulders, tail tipped with white and breast feathers tipped with fulvous. 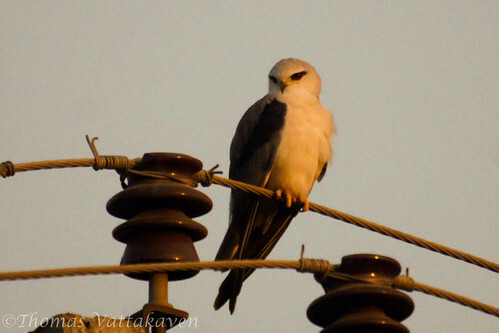 It is a bird of open country and frequents cultivated country and is generally seen in the vicinity of grassy areas. 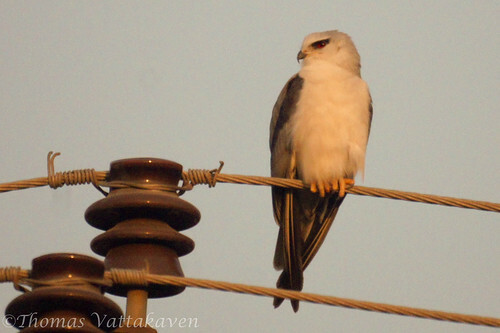 It can be seen perched on telegraph poles or hovering in mid-air. The wings extend beyond the tail when the bird is perched. While hovering it can swoop down on its prey. The pre consists of insects such as grasshoppers, crickets and other large insects, lizards and rodents. Injured birds, small snakes and frogs also fall prey. However, it does not always catch its prey like this. It also swoops at it from a perch or by hawking close to the ground. The bird is mostly silent but they are known to have a high-pitched squeal or a soft whistle. These birds are known to roost in communities of 15 or more birds. The nesting season varies widely and two broods per year have been known to be raised, with the rearing happening in more wooded areas. the nests are mainly twigs, lined with grass and placed in trees –preferentially Babul trees. Three to four eggs are laid. Other Details: A single bird seen perched on an electric post, adjusting its wings and jerking its tail up and down, in characteristic fashion and later looking out for prey studiously.